Trips and falls can lead to serious injuries, hip fractures, and head traumas in older adults – Freedom Home Care wants to help you take steps to prevent them. Each year, one in every three adults ages 65 and older slip and fall in the U.S. According to Physical Therapist Alice Bell, seniors who have fallen once are the most at risk of falling again. There are a number of factors that contribute to falls experienced by seniors, and any kind of fall can be especially dangerous for people with Osteoporosis. Known to many as the silent disease, Osteoporosis causes bones to slowly grow weak and brittle without warning. Many times a person falls and breaks a bone before they even realize that they have the disease. Other causes of trips and falls in seniors are slow reflexes, loss of traction, problems balancing, reduced muscle strength, vision problems, and dizziness. While these may be some of the leading and most common problems, family members and victims of falls tend to overlook the fact that many medications taken by seniors like heart medicines, blood pressure pills, muscle relaxants, and sleeping pills can also lead to falls. Another leading cause of falls in adults 65 and older is the consumption alcohol. While its effects – dizziness or sleepiness and the alteration of balance or reflexes – are not only felt by seniors, alcohol can lead to some pretty serious injuries for those who are more prone to falling. A physical evaluation can help seniors remain aware of any medical issues or limitations they may have. Taking medications as needed, without forgetting or consuming more than necessary, is an important part of an older adult’s daily routine. A lack of exercise can cause weakness in leg muscles and other parts of the body. 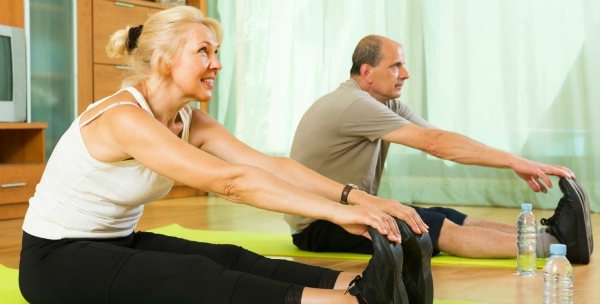 Choosing an exercise regime that builds core strength and improves balance is vital to preventing falls. Poor vision can inhibit a senior’s mobility. Yearly eye exams and glasses or contacts with the right prescription can help to eliminate the risk of falling. Putting things away that are easy to trip or fall over like books or shoes, installing handrails, placing grab bars in the shower or near the toilet, improving lighting, adding non-slip mats, using cordless phones when moving around, and wearing skid proof shoes are all effective ways of keeping seniors safe around the house. Sometimes falls can’t be prevented. If you do fall, try to fall forward or backward to keep from injuring the hip bone. Freedom Home Care also recommends keeping the bones healthy by getting plenty of calcium and Vitamin D, doing a bone mineral density test, and lifting weights. Be sure to check back to our blog often for more healthy and useful tips.